We’re excited to announce our brand new integration with Segment. It’s a big day: now all Segment users can get their user data flowing into Userlist.io in just a few clicks. Segment is a popular integration tool that pulls all kinds of data from other sources into one “powerhouse.” It helps you seamlessly sync customer data across 200+ business tools — such as marketing, sales, customer support, analytics, and others. 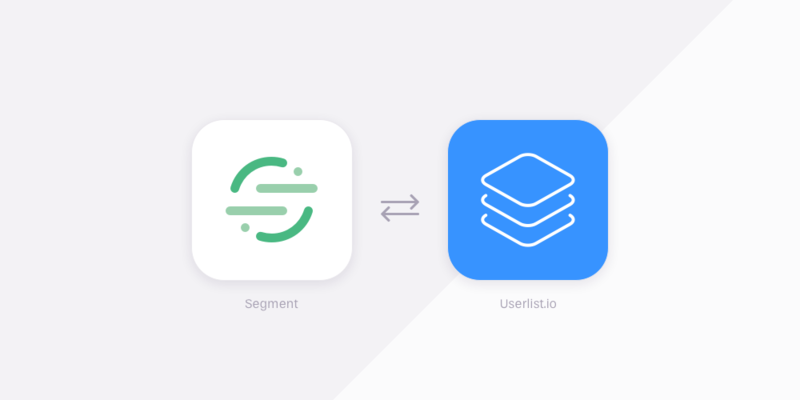 Instead of integrating each of these tools individually, you can integrate Segment once and then use their platform to forward data from your app (as well as other services) into services like Userlist. How does Userlist work with Segment? Instead of setting up a custom integration via our HTTP API, you can start sending your data from Segment in a few clicks (literally zero development time required). You can also see behavior data from multiple other services inside Userlist. Now our powerful automation features are at your instant disposal! You can view user activity, segment your users, and start sending behavior-based campaigns in no time. Add Userlist as a destination in your Segment account by choosing it from the catalog. Paste your Push API Key (found in Userlist settings). Voila, your data is flowing! Find detailed instructions in our help documentation.